In 1951, Miles Franklin recounted to American friends the ‘great fun’ which had erupted over Australian Aboriginal art. An old friend…was telling us recently that the administrators, in the interests of the art, have difficulty keeping track of who does the paintings. Namitajira [sic] will sign any of his tribes’ work with the greatest goodwill and also honesty for they are natural practicing communists. When a member of the tribe gets money or food all the others whack-in of natural right like the children of one parent. The administration supplied them with only a limited number of drawing boards each one numbered to try and keep order but that did not worry them, they beat out the white bark of trees and used that. It appears they have tremendous facility. Albert Namatjira, the subject of her condescending assessment, was forty-nine and the most celebrated indigenous man in Australia. He had exhibited paintings at solo shows across the country and starred in a nationally distributed documentary film. Though his work often displeased critics, unfairly rankled by his perceived ‘imitation’ of European water-colourists or the success of an Arrernte man working in a medium ‘entirely false to his own culture’, he commanded as much as 100 guineas per canvas. His luminous watercolours inspired a cottage industry of Arrernte artists, collectively known as the Hermannsburg School, after the remote central Australian mission he transformed into a tourist attraction. Nevertheless, as Franklin alluded in her letter, from his birth in 1902 Namatjira lived and worked under the care and surveillance of ‘the administrators’: Hermannsburg’s Lutheran missionaries. 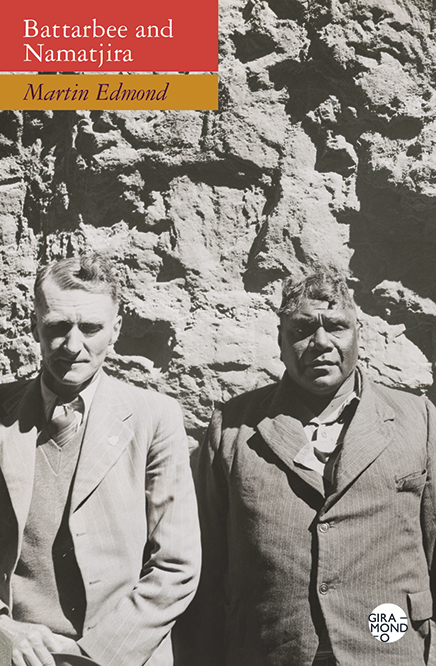 Martin Edmond’s Battarbee and Namatjira is a dual biography, documenting Namatjira’s life alongside that of his lesser known teacher, art-dealer, and friend Rex Battarbee. Drawing on Battarbee’s voluminous diaries and an extensive archive of personal papers collated by the poet Nigel Roberts, Edmond traces the evolution of the men’s relationship from their first meetings in the 1930s through to Battarbee’s wartime role as a Protector of Aborigines, and his uneasy control of Namatjira’s artistic output through the Aranda Arts Council. The author of two previous books about painters, including Dark Night: Walking with McCahon (2011)—a splendidly contemplative recreation of the New Zealand artist’s brief disappearance in Sydney—Edmond is well equipped to deal with this rich and troubling subject matter. Born in Warrnambool in 1893, and invalided out from Second Bullecourt in 1917, Battarbee trained as a commercial artist during a decade-long convalescence from his wartime injuries. In 1928 he purchased a Model T and, emulating the commercial and artistic practice of the Taos School, embarked on a fifteen-month long outback painting tour. On his ‘third attempt to find the way to paradise’ in 1932, Battarbee spent six weeks in Hermannsburg, the place he would ultimately spend much of his life. Returning with his ‘house on wheels’ a year later, he exhibited his work to thronged crowds in the mission schoolroom. Pastor Friedrich Albrecht, the mission superintendent, recalled the exhibition as revelation for Namatjira, who abandoned pokerwork for the more lucrative practice of landscape painting. Edmond, however, unravels Albrecht’s Damascene interpretation. Namatjira, a craftsman of decorated boomerang and woomera, had been exposed to European artists and their ‘side-on’ perspective for years before Battarbee’s exhibition, and had already asked the Victorian to help him acquire paint and brushes. The story of Albert Namatjira and Rex Battarbee is not one of ‘great fun’, nor is it an unalloyed tragedy. Rather, Edmond’s book is a powerful evocation of an artistic friendship that crossed cultural boundaries at a moment of flux in white Australia’s Aboriginal policy. Though the absence of footnotes or an index will trouble some readers, as will the awkward interaction between the text and Giramondo’s online photo archive, in the context of a captivating story of dual lives these concerns are minor. A compelling melange of history, biography, and criticism, Battarbee and Namatjira shines as brightly as both men’s watercolours and deserves a wide readership. James Keating is a doctoral research candidate at the School of Humanities and Languages at the University of New South Wales. He obtained a Master’s degree in History (Victoria University of Wellington, 2011) and worked as a historian for the Office of Treaty Settlements in New Zealand. His current research considers the individual connections and organisational networks that linked Australasian women’s rights activists with their counterparts across the world in the late nineteenth and early twentieth centuries. This entry was posted in Battarbee and Namatjira, Giramondo, Issue 14, James Keating, Martin Edmond and tagged Austalian Art, Australian Aboriginal art, Legend Press, Miles Franklin, Nigel Roberts, Visual Arts by Mark Roberts. Bookmark the permalink.